Need to hire a room last minute? Try the Brighthelm’s “Room in a rush” – hire a room last minute and get a 50% discount on the usual hire price. Strike a Light – Arts & Heritage has space available to rent in its’ Brighton’s Open Market based studio (mezzanine level) between 9am-6pm throughout the year. The space is big enough for up to 8 people, and is currently available for £6 per hour for a minimum of two hours per session. The building also houses a spacious licenced Brewhouse Café, run by Old Tree Brewery, specialising in botanical drinks and sprouted and fermented food. The cafe and adjoining atrium can be hired free of charge for events/workshops/talks/film-screenings, with the added benefit of in-house catering, an outside cafe garden area, free parking and disabled access. CAFE OPENING HOURS: The Old Tree Brewhouse Cafe is open to the public from 9am-5pm Mon-Fri. The space can be booked for events between 5pm-8pm Mon-Fri. On Saturdays the café space is available for hire from 8am-8pm. We are closed on Sundays and bank holidays. Tables, chairs and benches can be provided, as well as a white wall for projector screens, a sound system and extra lighting. Hire of the space is free (to community/non-profit groups). As well as the cafe menu, Old Tree can provide extra equipment, staff and bespoke catering services, including the serving of alcohol (brewed on-site) – prices on application. Restrictions may apply depending on desired use. All applications must be approved prior to event. Deposit may be required (refundable). For those experiencing or working with homeless people. Inspired by the recent Homeless World Cup held in Amsterdam and won by Mexico. Albion in the Community is providing FREE football sessions EVERY Friday at Hove Lawns, meeting at the Peace statue at 11:00am for those homeless people that would like to join ‘the movement’! This is followed for those that wish by access to First Base for refreshments and computer access. No requirement to be fit, or any previous experience just a desire to get together with others. A fully inclusive fun session!! Please share with anyone you feel may be interested. Brighthelm Church and Community Centre has over 100 chairs available to give away. If you are interested, please contact them directly on 01273 821512. Table tennis at your community centre? Table Tennis England are offering free table tennis tables to community centres in Brighton & Hove. The person to contact about this is Keiron Pelling on kieron.pelling@tabletennisengland.co.uk or 07972 222068. “I am a table tennis development officer working for Table Tennis England and I have been working with the Brighton table tennis community to increase the opportunities for people to play. This work includes the summer Ping! festival and putting funding towards creating table tennis sessions. Table tennis is a sport that can be enjoyed by everyone, and most people I speak to say they enjoy playing – but don’t have opportunities to play. It truly is an inclusive sport, attractive to the young and old, able bodied and disabled alike. To maximise the opportunities to play I have a small budget that allows me to place table tennis tables into places that can make use of them. How the table gets used is up to you. Whether it is just making it available to use by the community groups that use your venue or organising specific activity around it, I’m happy to work with you to make it work. There is no catch to this offer, so there are not any hidden costs to you – other than perhaps replacing bats and balls when they need to be replaced in the future. 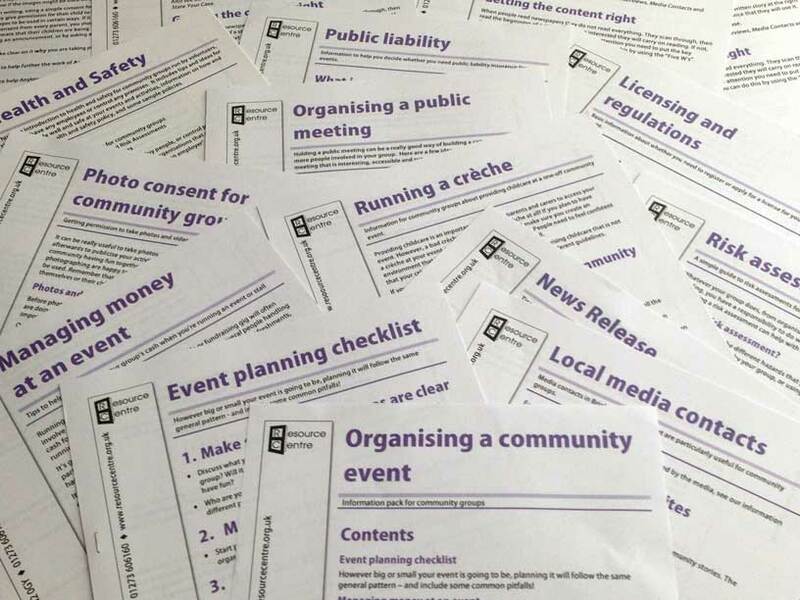 Thanks to funding from the Big Lottery, we have updated and improved our information on Organising Community Events. 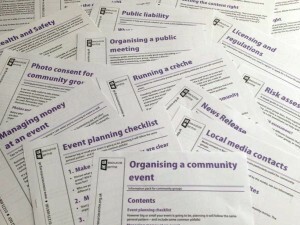 All these pages are also available as free printed information sheets, separately and as a whole pack. Just drop into the Centre to collect a copy for free. The National Citizen Service (NCS) is a National Government programme of personal development for young people. Groups of young people are guided by experienced and skilled team leaders and support staff to get jobs done for organisations. The project is aimed at building their confidence in skills such as project management and leadership and helps put them to them to good use within their own local community. Albion in the Community have run this programme with great success for 3 years in Brighton and Hove. This summer they have 180 young people aged between 16 and 18, who will have completed two weeks of challenge and skills workshops in their teams of 15. In the second two weeks, they plan and deliver a Social Action Project with a local organisation or charity. They have 30 hours each to offer to their project – that’s 450 hours each team – a lot is possible in that time!. From sporting fun days to sponsored walks, from brightening up old people’s homes to creating a stunning professional mural in London Road railway station – anything is possible! They are now looking for a range of opportunities for this summer 2015 . Prestamex House is vacating this week, and many hundreds of items of office goods and furniture are available to community groups, citizens and small businesses for free. Please email Cat at cat.scrip@gmail.com if you are interested in viewing or picking up items. Viewing and pick ups on Tuesday 24th, Thursday 26th and Sunday 29th 11am to 6pm, Prestamex House, 171 Preston Road, BN1 6AG. There’s free parking at the front of the building.